The Southern Football League's plan for Boyer Oval. 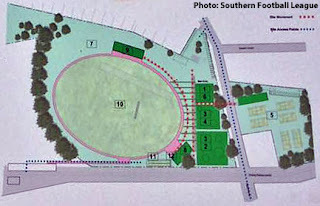 THE Southern Football League has welcomed the apparent announcement of the development of a sporting precinct based around Boyer Oval at New Norfolk. "A Shorten Labor Government will invest $2 million for the first stage of a Derwent Valley Sporting Precinct at the Boyer Oval at New Norfolk," a post on the SFL Facebook page said this morning. "The funding will be used to build a new amenities pavilion with AFL-size changerooms and undercover seating, as well as a new grandstand." The SFL says the project has been supported by the Derwent Valley Council and local sporting groups including the New Norfolk District Football Club. "The announcement was made by Shadow Minister for Regional Development and Local Government, Julie Collins MP along with Labor's candidate for Lyons Brian Mitchell and SFL president Madeleine Ogilvie, SFL league manager Ben Harrison and New Norfolk District Football Club president Ben Shaw." According to the SFL the new grandstand will be able to seat between 350 and 500 people. "This new precinct will be home to local AFL, netball, cricket and tennis clubs and associations and will also include squash and volleyball courts," the league says.